Hello again! This week Sandy chose Hippity Hoppity for the challenge. So she wants us to use a bunny or something that hops. 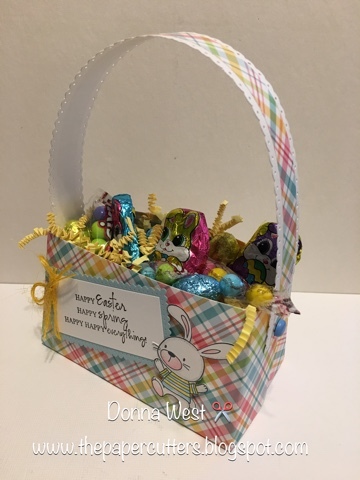 I chose a Bunny from My Favorite Things and put him on a little paper Easter Basket that I made using my We R Memory Keepers Gift Bag Punch Board. I was inspired by a die I saw for an Easter Basket. I thought the shape of the die looked a lot like the Gift Bags that I have made in the past using the Gift Bag Punch Board. So I played around with the Punch Board and came up with a fun little basket of my own! I hope you will join us this week on the Little Red Wagon blog and Sandy will pick her favorites next Tuesday. I can't wait to see all the beautiful creative projects! This is wonderful! How clever are you to come up with your own design!! Sweet sentiment too. 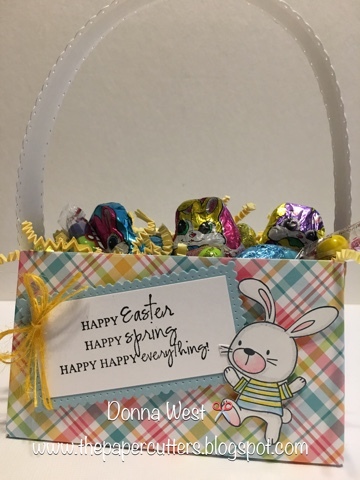 Such a sweet little basket, Donna! It looks fabulous, especially with that adorable little bunny on the front and the chocolates inside! Donna, this turned out wonderfully. May have to give it a try myself. Very creative! Donna, what an adorable little basket! And you created your own design?! You are amazing!